Home » Foul or Fowl – What’s the Difference? Foul and fowl are pronounced the same, even though they mean different things. One of these terms refers to birds, and the other describes something that smells bad. If you have spent any great amount of time around birds, you will know that they sometimes smell bad, as well. Thus, it is definitely possible to have a foul fowl. If birds played sports, there might also be such a thing as a fowl foul. You should be pretty well confused by now, if you weren’t already. Don’t worry; I will explain the meanings of these terms here. 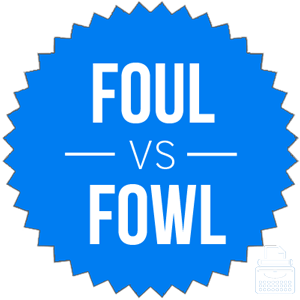 In this post, I will compare foul vs. fowl. I will use each of these words in at least one example sentence, so you can see how they appear in context. Plus, I will show you a helpful memory tool that makes choosing either foul or fowl much easier. What does fowl mean? Fowl is a noun. It means domestic birds kept for their eggs or meat. More broadly, it also means any type of bird, even wild birds. Wildfowl are birds that are not domestic. Waterfowl are birds that live chiefly on or near the water, like ducks or geese. A fowler is a person who hunts birds. Bertie and his father, Henry, went into the marshlands to hunt fowl with their dog, Mackie. The wetlands are home to many species of fowl, including herons, ducks, hawks, and a variety of songbirds. Fowl is a very old word; it has been part of English for at least 800 years and it is likely that it’s been in the language for over a millennium. It is related to a High German word that meant birds. What does foul mean? Foul is an adjective with an completely unrelated meaning to that of fowl. Foul describes something that is bad, against the rules, or unpleasant. Something that smells foul, for instance, smells unpleasant. In baseball, a foul ball is a ball that has travelled outside of fair play after being struck by a batter. The ghost of Hamlet’s father cried, “Murder most foul!” when Hamlet tried to speak to it that night on the wall. Megan farted, and then tried to shift suspicion away from herself by declaring “something smells foul in here,” before anyone else noticed. In sports, foul is sometimes a noun, where it refers to an action that is against the rules. Like fowl, foul can be traced back to High German. Although the two words are pronounced the same, though, they have different roots: foul comes from an entirely separate word that meant rotten. While these words sound the same, they are different parts of speech and can never be interchanged. Foul is an adjective that means bad or unpleasant. Fowl is a noun that refers to birds. Foul can sometimes be a noun, but fowl is never an adjective. Thus, if you need a noun, use fowl, and use foul as an adjective. Remember Fowl vs. Foul: Since fowl and wren are both nouns that refer to types of birds, it shouldn’t be difficult to remember that fowl refers to birds, and is never an adjective. Is it fowl or foul? The terms are never interchangeable, so be careful when using these tricky homophones. Foul is an adjective that means unpleasant or against the rules and sometimes a noun that describes a forbidden act in sports. 1 What is the Difference Between Foul and Fowl?